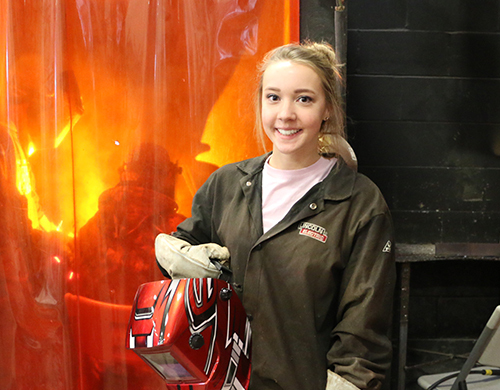 At FSCC, students can expect to be educated by trained instructors who have not only taught the trades, but are well-known professionals in their trades. Instructors teach in the classroom and in labs for hands-on learning with tools of the trade. The curriculum has been developed by the National Center for Construction Education and Research. Upon completion of the classes, students will earn recognized credentials for that specific trade, which will be entered into a national registry that is portable and available to contractors. FSCC’s Construction Trades program is unique due to its 2 + 2 + 2 program. A student can start in this program as early as junior and senior year of high school earning college credit toward their degree. The student could earn his or her associate of applied science degree at FSCC and then transfer to Pittsburg State University. Students who follow the 2 + 2 + 2 program will not have to duplicate coursework in any of the three phases of their education. The construction industry as a whole is lacking trained professionals. According to the Occupational Outlook Handbook published by the Bureau of Labor Statistics, the employment outlook is excellent. There is an expected job growth of 10% through 2024. The earning potential for a trained professional in any of specialty trades related to construction, both commercial and residential, averages $20 per hour nationally. There is a need in all specialty trades including carpentry; welding; masonry; and heating, ventilation, and air conditioning. Students can apply for program and institutional scholarships here, or they may pick up a scholarship application in the Construction Trades Office. For more information about scholarships, call 620-223-2700. Kansas DegreeStats is interactive online tool that reviews cost and earnings data from real graduates for each undergraduate degree program offered at a public college or university in Kansas.